Bitcoin (BTC) operates on its own blockchain. BTC is minting through the mining process. The total supply of Bitcoin that will ever be issued is 17.67 Million coins, and the current supply of BTC in circulation is 17.67 Million coins. Current Bitcoin price is $ 5,303 moved down to -2.35% for the last 24 hours. All time high (ATH) price of Bitcoin reached $ 19,786 on 17th Dec 2017 and fallen -73.2% from it. Bitcoin's share of the entire cryptocurrency market is 53.11% with the market capitalization of $ 93.68 Billion. Bitcoin’s 24 trading volume is $ 11.26 Billion. It is trading on 192 markets and 73 Exchanges . 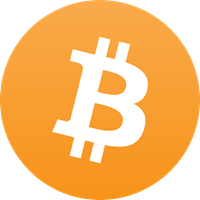 Find more details about Bitcoin cryptocurrency at the official website and on the block explorer. Bitcoin price Index provides the latest BTC price in US Dollars and ETH using an average from the world's leading crypto exchanges. The Bitcoin to USD chart is designed for users to instantly see the changes that occur on the market and predicts what will come next. Bitcoin is an innovative Internet Protocol inventing anonymous peer-to-peer digital value transactions without a need of a central authority or a bank to execute transactions, which means it is fully decentralized. The issuance of Bitcoins has become reality via the collective consensus of the network nodes. Bitcoin is open-source, open to the public and no one has control over it. Permissionless and borderless. This means that the software can be installed by anyone anywhere in the world. You do not need to provide any ID or pass KYC/AML, which constitutes technology suitable for the unbanked, the privacy-conscious communities, or people in financially underdeveloped or sanctioned countries. Bitcoin cannot be tampered since nobody is able to block or freeze a transaction of any amount. Irreversible once transaction added to the blockchain. However, consumer protection is still possible. Fast. Transactions can be processed within seconds and become fully irreversible within an hour. Available and online 24 hours a day/ 365 per year. These transactions are tracked on the “blockchain,” commonly referred to as a distributed ledger. This ledger records every bitcoin transaction ever made. Each “block” in the blockchain is built up of a data structure based on encrypted Merkle Trees. This is particularly useful for detecting fraud or corrupt files. Even if a single file is corrupt or fraudulent, the blockchain prevents it from damaging the rest of the ledger. The Bitcoin supply is stable and predefined at 21 million Bitcoins. New bitcoins cannot be issued or debased. Bitcoin’s blockchain inherent rules guarantee that only 21 million bitcoins will ever exist. The bitcoin block reward is halved every 210,000 blocks, meaning that when the next halving occurs (27 May 2020) the reward will be reduced to 6,25BTC. Today 1800BTC is mined every 24 hours, which means that 2140 will be the last year the last single Bitcoin will be ever mined. Additionally, there are no storage costs as Bitcoins do not take up any physical space regardless of the amount. They can also be stored on a hard disk or in a paper wallet. Most importantly, there is no counterparty risk, since no one can take Bitcoin from your wallet unless your private key is exposed. The basic technologies behind Bitcoin are public-key cryptography, peer-to-peer networking and Proof-of-Work consensus mechanism for payment verification. One of Bitcoin’s most appealing features is its verification process, which minimizes the risk of fraud. Bitcoin is decentralized and kept secure by “miners” — continuously verifying transactions and getting block reward in exchange for their work. Once a specific amount of transactions is verified, another block is added to the blockchain and process continues as usual. Each payment transaction is broadcasted to the network and included in the Blockchain to avoid double-spending. After a couple of minutes, each transaction is securely stored on the blockchain by the massive amount of processing power that continues to extend the Blockchain. Using this technology, Bitcoin provides a secure, fast and transparent way of payment execution.